I'm worn out from a long day of fossil hunting but I thought this was worthy of passing on. 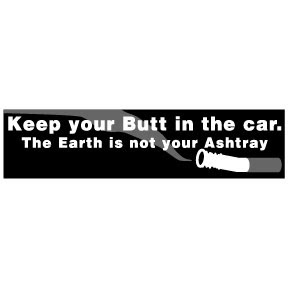 For all those morons who think cigarette butts biodegrade, read on. Not only do they not biodegrade, it turns out they are really good at killing fish. Why not help out the cause and support one of the coolest companies on Earth, Northern Sun. Your car can sport the following bumper sticker just like my co-worker Julie. Enough said.